Tim Lashar has made Oklahoma his home for more than 30 years. He attended the University of Oklahoma, where he majored in Broadcast Journalism and was the starting placekicker for the Sooners and member of the 1985 National Championship team. After a brief stint in the NFL, Tim returned to Oklahoma, where he eventually started a family and became active in the community. Tim served as Area Representative for the Fellowship of Christian Athletes and worked in the local radio market, doing live broadcasts of sporting events and working in the sales department. It was during this time that Tim was approached about entering the heating and air conditioning industry. In 1994, Tim was hired by a trusted family owned business that had served Norman for over 50 years. He quickly earned a reputation as a hard worker and respected leader in the HVAC industry and was named General Manager in less than four years. In 2004 Tim was hired by York International as a Brand & Outdoor Products Marketing Manager. Tim gained valuable knowledge of the manufacturing and distribution side of the industry and a deeper understanding of product development. The experience was exceptional, but he could never shake the desire to own his own company. Realizing the need in his hometown for a trusted service provider, Tim partnered with an old industry friend he respected. Together, they ventured out and Lashar Home Comfort Systems was born in 2007. The vision was simple: “to be the most trusted home comfort service provider in the state of Oklahoma.” Bringing a multifaceted understanding of the industry, as well as a trusted reputation in the community, LHCS is able to offer a unique customer driven approach to the heating and air conditioning needs in the greater Oklahoma City area. Tim has been married to Kelly for 20+ years and together they are raising three daughters in Norman. Tim is a graduate of Leadership Norman and has served on multiple community boards, including the American Red Cross, Fellowship of Christian Athletes, Norman Chamber of Commerce, Norman Rotary Club, Norman Youth Soccer Association and the Sooner Theatre. He has coached youth sports and is active in his church. He is often called upon to share motivational messages to organizations and clubs around the state. Customer care and satisfaction are core values of Tim and his company. His priority has always been to grow a company with the right employees that share his vision and respect for the customer. Today, we are proud to boast 15 employees with a combined 200+ years experience. These top notch service and installation technicians will treat your home as if it were their own. 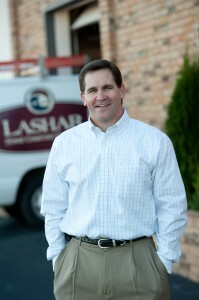 Ultimately, by naming the company Lashar Home Comfort Systems, Tim has put his name and reputation behind all of his services and products, and has set a standard of quality service and customer care. THANK YOU for trusting Lashar Home Comfort Systems!